Posted on September 8, 2010	by Lou Murray, Ph.D.
Once again, I’m late in posting my Harvest Monday results. It was Labor Day weekend and I had other things on tap. What, you ask, could possibly be more important than posting Harvest Monday results. Well, Mr. Greenlife and I went shopping for (and bought) new furniture for our family room! We’ve been dithering about this for a couple of years and finally bit the bullet, made some decisions and bought new furniture. In a nod to the environment and the American economy, we bought Mission-style furniture that is being hand-built in Indiana (my old home state) by Amish woodworkers who use sustainably grown American hardwoods. The new furniture should arrive in November and last well beyond our lifetime. These will become the antiques of tomorrow. In an era when everything seems to come from China, we did our bit to support our own economy. BUY AMERICAN! 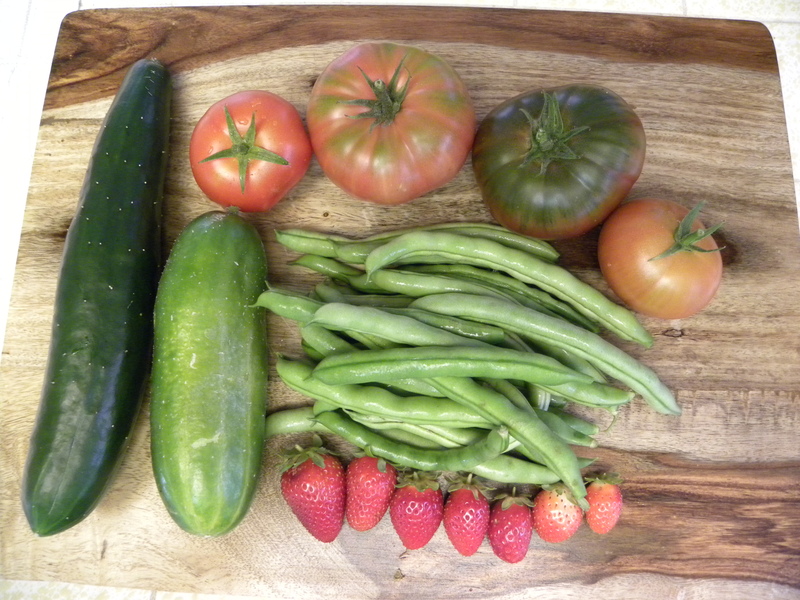 One day's harvest--Summertop and Tendergreen cucumbers, green beans, tomatoes and strawberries. We got our first ripe Mortgage Lifter tomato this week. The tomatoes are large, deep pink, flattened on the bottom, and quite tasty. The plants are fairly productive for an heirloom. They’re outperforming the Black Krims and Brandywines. The latter have still not given us a single ripe tomato, but there is still time. I still have a lot of planting ahead to get the Garden of Perpetual Responsibility looking good. One of my Savoy cabbages was starting to split, so I harvested it. Not the prettiest cabbage ever, but boy did it taste good. I've never had a better cole slaw than the one I made from my own cabbage. 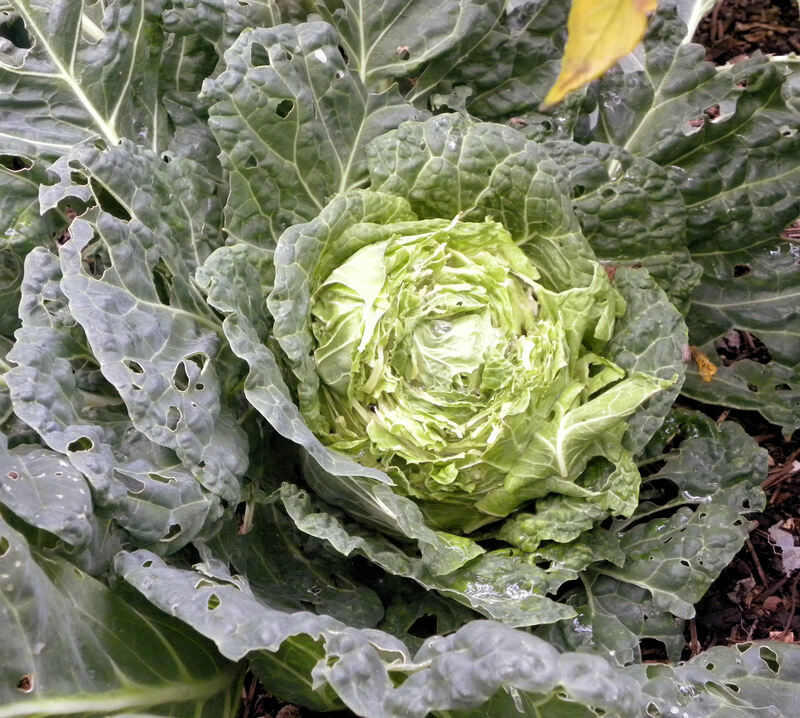 The chickens got all of the outer leaves of this cabbage. I made cole slaw with the small head, after picking out the slugs and wireworms. Best tasting cabbage I’ve ever had, and the first savoy green I’ve successfully grown from seed. 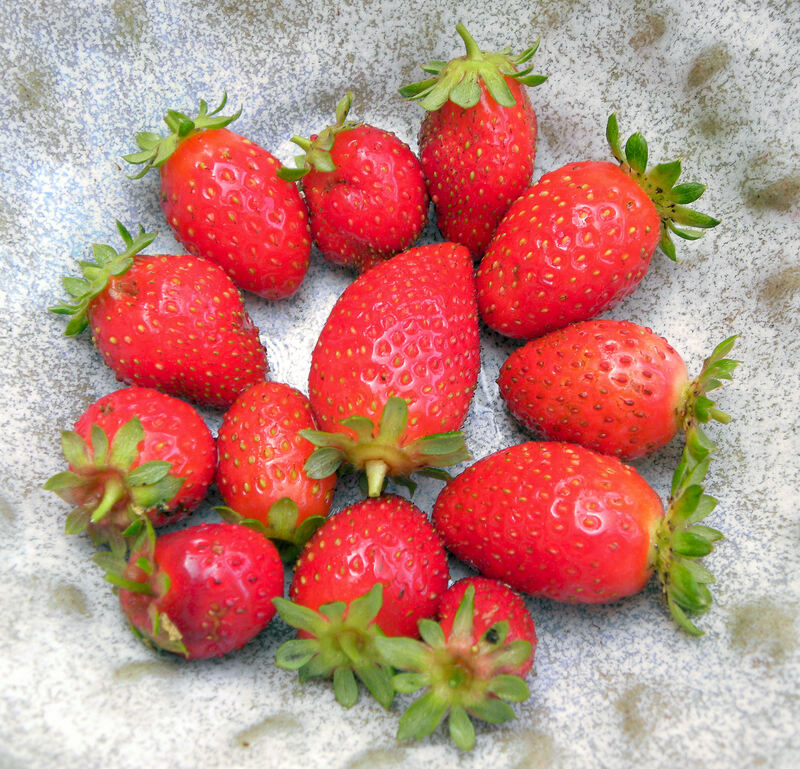 The strawberry plants in my strawberry jar are producing a second crop. These berries are smaller than the June crop, but even more welcome now that it's September. 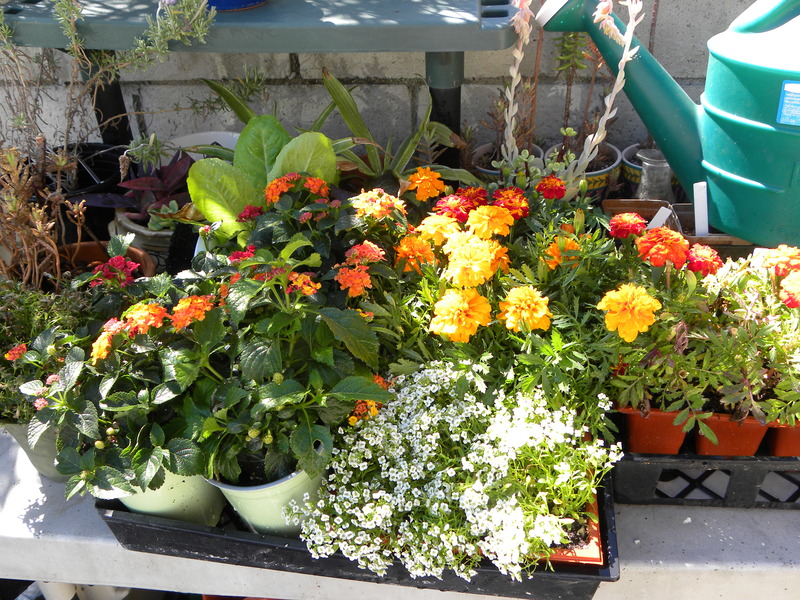 Visit Daphne’s Dandelions to see what others picked on Harvest Monday. This entry was posted in Uncategorized and tagged Black Krim, Brandywine, Harvest Monday, heirloom tomatoes, Mortgage Lifter, strawberries, vegetable garden. Bookmark the permalink. “the antiques of tomorrow” what a great phrase! I saw the name Mortgage Lifter on a seed company’s list, but I haven’t seen it much among the other Harvest Monday gardeners’ tomato harvests. I guess it’s just not as popular as the Brandywines, Black Krims, and the Chreokee Purples. I’m glad to hear that you like the flavor and the productivity! The strawberries look juicy and delicious. Hi Thyme. The flavor of Mortgage Lifters isn’t as good as the Black Krim. Since my Brandywines STILL aren’t ripe, I can’t do a comparison there. But the Mortgage Lifters sure are productive, best plants I have right now. We did the same thing. We bought furniture for the new house that was made in our state. Though our dining room table was handmade in Vermont. I love supporting the local craftsmen. Not all our furniture was local, but most of it was. You’re killing me with the strawberries however. I really wish I had some to eat this year. I’ll have to plant some next year. This year I’m going to spend a lot of time picking out varieties of fruit. Good for you, Daphne, for buying local. These days, even made in the US is rare, but local is even better. Oh, good, you’re going to get some fruit trees.